The Avi will be the host for the SCJB May 2018 trip Mothers Day weekend of May 11th, 2018. 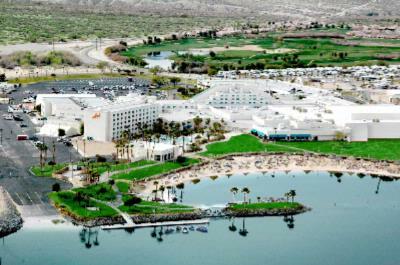 The Venue will be The Avi Resort and Casino which is between Laughlin and Needles. You must call and book directly with the Avi to get the group rate. Rates will not be honored through booking sites. Group rate expires on April 26th at midnight! ** Nightly Fee's and Taxes not included. Room upgrades to the beach tower will be an additional cost. SoCalJetBoats.com does not condone wreckless driving, driving while intoxicated, or breaking the law. SoCalJetBoats.com and any affiliates of this event are in no way responsible for any damage, injury or death as a result of attending this event. The Staff at SoCalJetBoats.com would like to remind you to boat safe, boat smart, and have fun. Alright made reservations. Will be there with Daytona and the family. Will be a first at avi for me, I here the ramp can be a pain?? Any thoughts. Question : How crowded does the Avi Beach get for this event? The ramp is a pain because it launches right into open water and is only 2-3 trailers wide. It is protected a bit from the current but you get the waves from boats passing by. Usually a few people hang out to give each other a hand to hold boats and get everyone off the water safely. It's pretty crowded. You gotta get up early to get a spot. As the day goes on the water level comes up and makes for more room. It's usually 2 deep at the events. Sometimes 3 deep. So basically boats nose in on the beach then boats behind them anchored nose out. The ramp is a pain because it launches right into open water and is only 2-3 trailers wide. It is protected a bit from the current but you get the waves from boats passing by. Usually a few people hang out to give each other a hand to hold boats and get everyone off the water safely.It's pretty crowded. You gotta get up early to get a spot. As the day goes on the water level comes up and makes for more room. It's usually 2 deep at the events. Sometimes 3 deep. So basically boats nose in on the beach then boats behind them anchored nose out. Thanks Brad, planted the seed with the wife. She’s not into crowds but didn’t say no. Haven’t had the opportunity to attend an event yet. Always looks like fun. Just bought my first jet boat need to test it ouutttt!! Questions: Do people party all night on the beachfront? Leave boats in water overnight? Sorry, I have a hard time with understand this site. Is this a general gathering with jet owners? Is there a fee or activities? No fees, just good times, really no activities other than a bunch of good people and badass boats all gathered in one spot for the weekend. A bunch of people like to get together and cruise up to back bay and hang out and there’s also lazy Harry’s that people will cruise to for lunch or some drinks. I personally really enjoy going up to back bay for a bit then floating with a group back down towards the Avi. I'll be there with the Baja.